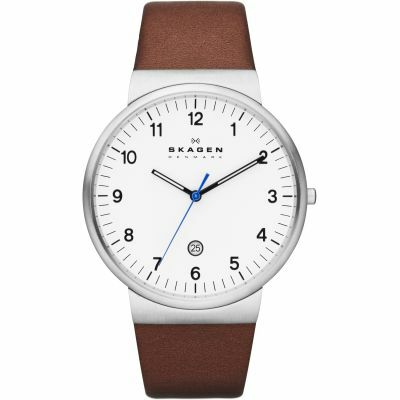 Skagen Ancher SKW6108 is an amazing and attractive Gents watch. Case material is Stainless Steel while the dial colour is Grey. The features of the watch include (among others) a date function. This model has got 30 metres water resistancy - it can be worn in scenarios where it is likely to be splashed but not immersed in water. It can be worn while washing your hands and will be fine in rain. We ship it with an original box and a guarantee from the manufacturer. Lovely timepiece. Only problem is strap has frayed on edge having got caught in something. Have to get replacement strap which is awkward. I bought this product for my boyfriends birthday as he’s been wanting a new modern watch for everyday use. Ordered when the weather was bad last week and they kept me upto date with the progress of my order due to a day delay in being delivered. Lovely looking watch my husband was more than happy with it , looks very smart . He loved the colour . I found it a little difficult to use the catch but hes used to it now . From start to finish excellent service notified all the way on my delivery the only thing I didnt like was the date & time were not set correctly. Excellent in all aspects - Website, Order process, Delivery and Communications. Extremely pleased with my purchase very good quality and excellent Value for Money compared to other Stockists. Thank you very much. 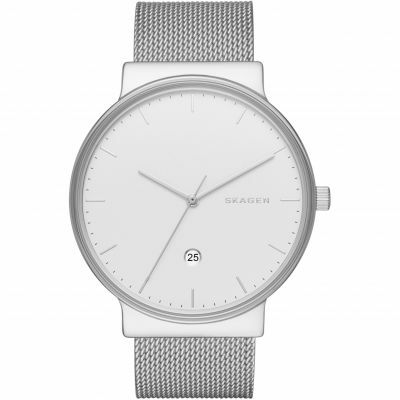 Nice watch, sleek minimalist design as youd expect from Skagen. Quick, efficient delivery by Watch Shop. Lovely elegant watch, super minimalist. Easy to adjust. The watch is a gift so I can only say that it looks very modern and elegant. It was delivered very quickly and well packaged. I look forward to it being opened on Christmas morning. Gave my partner this as a gift for his birthday this morning. So far we are both incredibly pleased with it. Exactly as described, very slim and dark. Stylish and looks more expensive than it is. Bracelet is of higher quality than it looked in the pictures too. Watch shop service very impressive. Packaging and speed of delivery spot on. Watch presented in beautiful box. good service, item arrived quickly and as described. This watch is stylish and comfortable. Also goes with a variety of looks. It is exactly how it looks in the picture, and is not too big and bulky. Just right. Thank you. 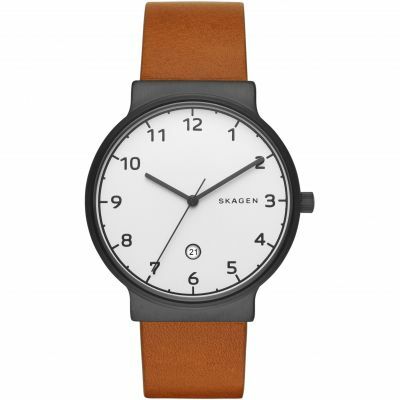 Lovely watch, great gradient on the strap, minimalist face and good material. \r\nCan be used as both a show piece on a suit or day to day. \r\nComfortable and works with most outfits. Very stylish, looks great. Easy to adjust strap to fit. good watch, nice design , very light, easy to read from. Lovely watch, slim and elegant and much appreciated. Easily adjustable strap. 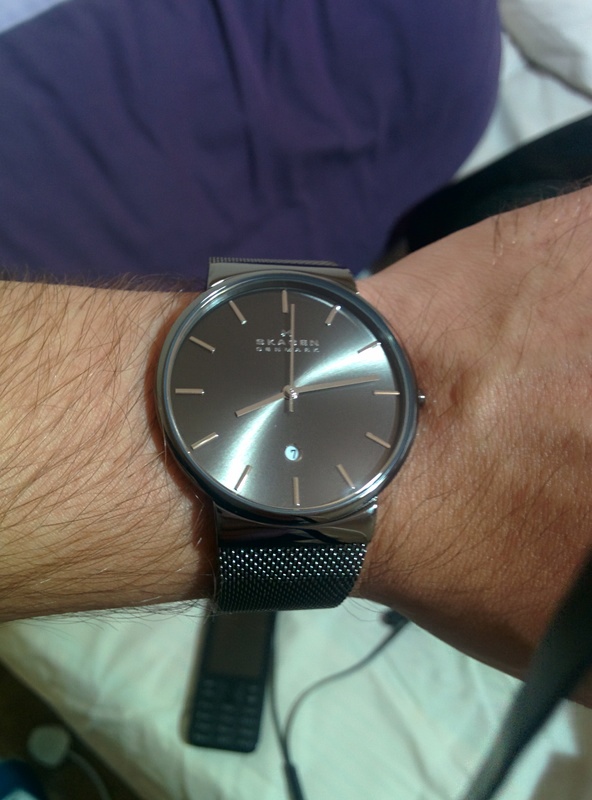 This is my second Skagen watch from Watchshop and Im not disappointed! Fast delivery, great design. Bought as a dress watch because of slim design fits nicely under cuffs.Service ,price and delivery all excellent . Lovely watch. Slim design makes it look really classy. Love the colour. Dark grey. Bought for my partner and he loves it. Very impressed. Sleek and stylish. I bought it for my husbands birthday and he loves it. Looks smart and perfect for work. Packaging was lovely, from the Skagen box to the watch shops gift wrap. Very thin profile, with a nice open, minimalist clockface. Comfortable, especially for all all-metal watch. Doesnt make your wrist smell! My second Skagen watch. They are very stylish ans excellent value for money. I particularly like the large dial and that it is very slim. I favour the mesh strap. 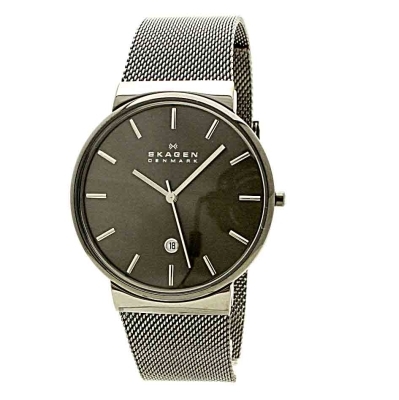 Another excellent and beautifully crafted Skagen watch. The slimline features of the watch really suit a slim wrist and the recipient loved it for his 30th present. Arrived vey quickly, beuatifully packaged and went down a storm with our son. Looks as good in person as it does on pictures. arrived bang on TIME, packaged in a way that would stand up to a long TIME in transit. company made contact in a TIMELY manner. This is a beautifully striking watch. Its slim, contemporary design is very stylish and I cant wait to give it to my husband for his birthday! A very stylish yet comfortable watch. Clear details of time but you need good eyes to read the date as it is so small. The clasp is very neat and secure but like all things new will take a bit of getting used to. All in all very pleased with my purchase. Very nice watch. Fits good. Excellent value for money. Lovely looking watch. Picture shows this accurately. Fantastically prompt service. Just disappointed the postman left it outside in torrential rain. The box was damaged but the watch seems ok. Not given it to my husband yet but think he will love it. I bought this as a gift for my boyfriend and he loves it. It is by far the best watch I looked at, it is very modern, quite minimalist and a great colour. It is a really dark grey and looks professional but a bit special, it is not as shiny as it is in the picture- it is more understated and even nicer. The clasp to get the watch on is a bit complicated and unusual, but it can be adjusted at home, which is really useful. The watch was very stylish, light weight and great for everday wear!